Which Teachers do you remember from Churchill & Sarsden School? Mr. William Henry Anson 1892 1929 W.H. Anson was the Headmaster of the school for 37 years from 1892 to 1929. His grand-daughter, Angie Robson and Great-Grand-Daughter, Michelle Catling, live in Churchill Village today. Mr. Anson was also the Choir Master and Organist. Mr. Anson’s photograph is in the book, Churchill & Sarsden, by Alan Watkins. 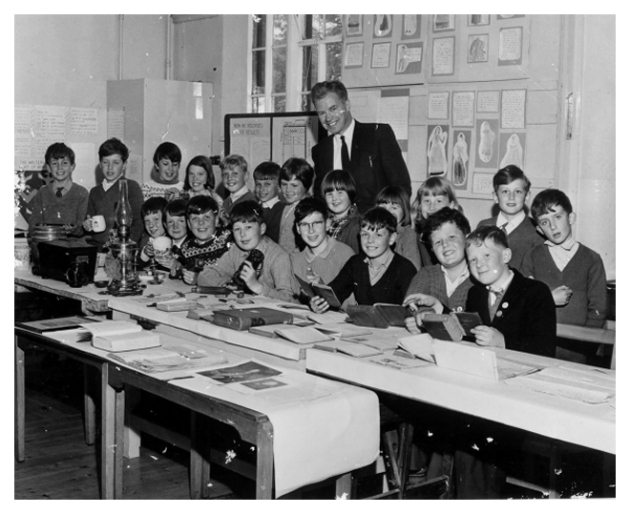 He is pictured on page 30 with the rest of the staff at the school in 1929 and on page 47, in 1935, when mugs were given for the Silver Jubilee. Miss M. Webb 1929 at least 1929 at least Photograph included in the book, Churchill & Sarsden, by Alan Watkins. Miss E. Hill 1929 at least 1929 at least Photograph included in the book, Churchill & Sarsden, by Alan Watkins. Miss Alice Amy Morris 1 July 1915 31 March 1938 Born 21 Sept 1890, died 9 April 1987 aged 96 at Langston House, Milton-under-Wychwood. Photograph included in the book, Churchill & Sarsden, by Alan Watkins. Mrs. Isobel M. Harman 1968 at least December 1981 Mrs. Harman stayed at teh school until closed in December of 1981. She was Acting Head from 2md September 1980. As of October 2001, Mrs Harman is still living in Chipping Norton. Mr.Michael E. Cockburn 1970 at least unknown Mr. Cockburn was the Head Master up until 1968 it is believed. After that it is thought that he moved on to the Green School in Chipping Norton. He was followed as Headmaster by Mr. Warland. Mrs. Deacon 1971 at least 1973 at least Mrs. Deacon worked part time at the school and teached the older classes. Mr Arthur Warland 1973 at least 1975 at least Mr. Warland was the Head Master from 1968 it is believed. He followed Mr. Coburn. Mrs Harling 1962 estimate 1967 estimate Shaun Donaldson recalls Mrs. Harling when he was at school.